Who is that little kid? Who is that Little Kid? is another cute offering from the Dutch team "Sieneke & Tineke". The 'story' is more a series of pages asking, "Who is that little kid?" with pictures of kids doing things like playing, eating or spending time with family members. The book is just the right length for toddlers, although my 5 year old also enjoyed it a lot. He especially liked guessing what the child was doing before I read the answer on each page. 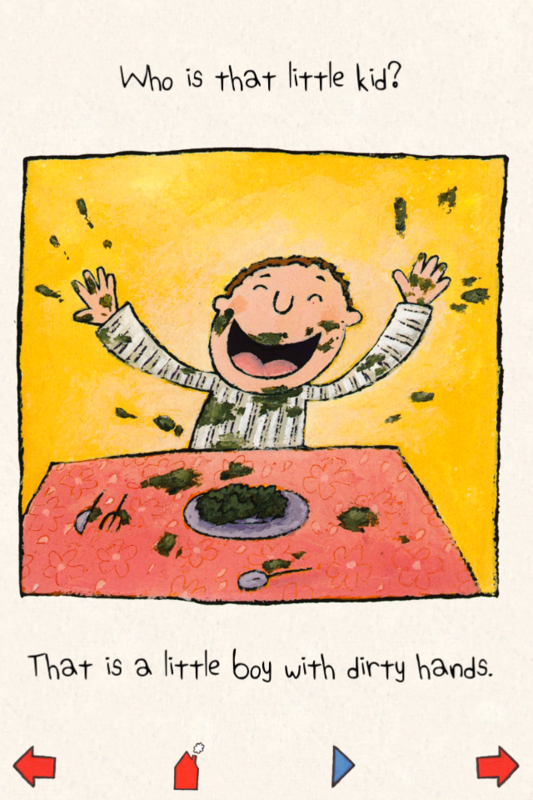 The book is also humorous and enhanced by funny sound effects. Every page has a few unique sounds to be triggered, but nothing that would encourage senseless tapping. The kids in most scenes have great 'laughing' sounds as well as a wide variety of other expressive sound effects that communicate emotion. The illustrations are hand-drawn and based on the toddler books this team created in print over the last decade. Three of the drawings are available in the extras section as coloring pages. It's a small number, but set up in a nice way. The child touches a color and then taps in an area of the picture to 'fill' in the color. There is also a 'home' button and settings to turn off the narration, available in English, Spanish or Dutch. Overall, this is a short & sweet little digital book that is well made and engaging for little ones. Story Synopsis - Who is that little kid? In this book for toddlers and young children, the kids shown on each page are doing something fun. After the question, "Who is that little kid?" comes the answer, "That is a little girl doing ... " or "That is a little boy doing ...". The following scenes are shown: A little girl walking in her mother's big shoes, A little boy eating messily with his hands, A little girl with a pillow under her shirt (trying to look like her mom, who is pregnant), A little boy reading with his aunt, A little boy riding a toy car, A little girl drawing a picture of a person, A little girl playing with her baby brother (he is pictured pulling her hair), A little boy in a playhouse, A little girl riding on her uncles shoulders, A little boy with his face painted to look like an animal, A little girl sitting on top of a big dog, A little girl sitting in front of a mirror. A hug and a kiss!